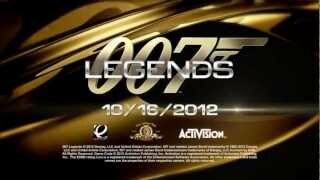 Activision has announced today that 007 Legends will feature a variety of past and present Bond talent including Daniel Craig, Michael Lonsdale, Naomie Harris, Richard Kiel, and others. 007 Legends will feature Daniel Craig's James Bond while Rory Kinnear voices MI6's Chief of Staff, Bill Tanner. The Moonraker mission features familiar Bond actors, including Michael Lonsdale reprising his villainous role as Hugo Drax and Richard Kiel as Drax's notorious henchman - Jaws. Naomie Harris, from this fall's feature film SKYFALL, will also make a video game appearance in 007 Legends. In addition, veteran Bond film and video game writer, Bruce Feirstein (The World Is Not Enough, Tomorrow Never Dies, GoldenEye), pens 007 Legends' overarching storyline while the James Bond film composer - David Arnold - and TV composer, Kevin Kiner lend their musical expertise to the game soundtrack. 007 Legends features an original, overarching storyline tying together five classic Bond movie-inspired missions plus a sixth mission based on this year's highly-anticipated movie - SKYFALL - which will be available post launch as downloadable content. Planned to launch on October 16 2012, 007 Legends is being developed by Eurocom for the Xbox 360, PlayStation 3 and, newly announced, download on Windows PC. There are currently 0 members and 80 guests on the website right now.